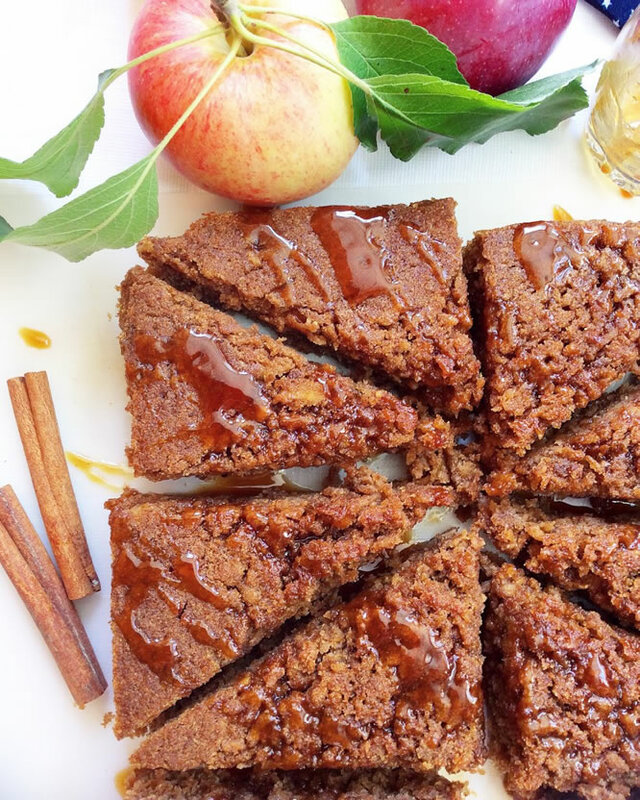 A fall-inspired cake made with wholesome ingredients and loaded with apple flavors. Boiled cider becomes a thick, sticky caramel sauce to drizzle on top for extra sweetness. Preheat oven to 350 degrees Fahrenheit. Line a 9-inch square (or round) pan with parchment paper. Set aside. Add all wet ingredients, including the shredded apple, into a mixing bowl. Stir well to combine. Add all remaining ingredients (all dry), and stir again just to combine. Don’t over mix. Pour cake batter into prepared pan, and bake for 40-45 minutes, or until cake is cooked through. While cake cooks, make the boiled cider caramel. Pour cider into a small pot, and set it on the stove over high heat. When cider is boiling, reduce to medium-low (to simmer), and let cook for the entire time the cake is cooking (about 40 minutes). Stirring isn’t necessary. Just be sure to keep an eye on it to be sure it doesn’t accidentally boil away into nothing and burn the bottom of your pot. This has never happened to me. Add vanilla, cinnamon, and salt, and stir to combine. Remove from the stove and let cool to room temperature. When cake and caramel have cooled, remove cake from the pan and drizzle it with caramel. You should only have a few tablespoons of caramel, but it’s plenty. Cut the cake into 12 slices, and serve. If not eating immediately, store the caramel separately in the fridge and drizzle it on the cake when serving. Otherwise, the cake will soak up all the caramel and be extra sticky (not necessarily a problem, but it changes the texture). Leftover cake keeps at room temperature for 4 days. *Be sure to choose cider that’s made with just apples (like Quonquont cider). To be clear, I’m talking about regular cider, NOT hard cider. It isn’t carbonated. **Scoop the apple shreds into your fist and squeeze over the sink to remove extra moisture.